These evenings take the guise of facilitated workshops, ‘theatresports’ or theatre outings. Workshops thus far have covered a variety of topics ranging from A Stanislavsky-Method workshop to Theatre make-up (which saw the learners getting into touch with themselves at the age of 80!) to a rousing Hip Hop evening facilitated by the current South African Hip Hop Champion. Short courses on characterisation, improvisation and sound and lighting have also been offered. In addition to the Society, there is a major production in the first term each year alternating between straight plays and musicals, the Eisteddfod One Act Play and Movement Festival in the second term, and the Inter Schools One Act Play and Movement Festival in the third term. Society members are encouraged to take part in all aspects of these productions, both on stage and behind the scenes, two of which have toured to the Edinburgh Festival Fringe. Society members are also urged to audition for local advertisements and films, and a number of them will be seen in the upcoming SPUD 2. At the end of 2012 a society meeting facilitated by Duncan Rice, Principal of the Helen O’ Grady Drama Academy, was filmed as an example of drama as an educational tool and is being used world-wide. Society members attended Pieter Torien’s production of Andrew Lloyd Webber’s rock musical, Jesus Christ Superstar at the Artscape Theatre. As there was an OD involved in the production we were lucky enough to be shown around backstage after the show and to see the set in more detail. We were also introduced to members of the cast. Duncan Rice, principal of the Helen O’ Grady Drama academy, has facilitated a number of workshops for us ranging from basic characterisation and warm-up techniques to cutting edge improvisation and method acting. He was so impressed by the standard of the boys that the society was invited to be a part of a major promotional documentary which stressed the importance of drama as an educational tool. The documentary is currently being used world-wide. Two very exciting workshops have been held in collaboration with Ivy Meyer, principal of the Out of Africa Dance Academy. These workshops were facilitated by both Ivy and her son, Jason Meyer, who has been the reigning SA Hip Hop Champion for 3 years. Boys were introduced to basic Hip Hop moves and treated to a display of Hip Hop excellence from Jason and other members of the academy. Two very successful tours to the Edinburgh Festival Fringe, which is ‘the biggest cultural festival on the planet’, have been undertaken. Members’ roles have included: actors, sound and lighting technicians, props, costumes, prompt, assistant director and marketing of the shows on the Royal Mile. Although the performances of Master Harold ... and the boys and Biloxi Blues were central to the tour, there was also time for sightseeing in both Edinburgh and London. We were also able to enjoy top class theatre both in Edinburgh and on the West End. 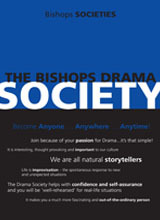 The Drama Society meets on Tuesday evenings, usually, two to three times a term, in the Memorial Theatre from 19:00 – 21:00. There are no specific meetings this term as members are involved in the major musical, Oklahoma!. There is, however, a theatre outing to Dirty Dancing being planned – dates still to be announced.